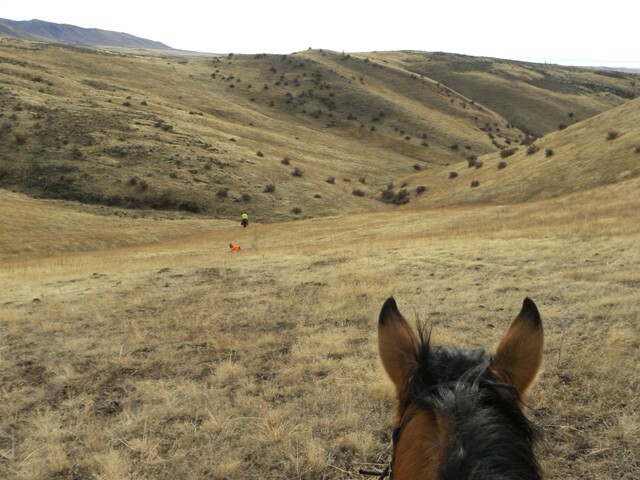 A typical equestrian ride on a not-so-typical winter day turns into an unexpected adventure for two members of the Squaw Butte chapter. 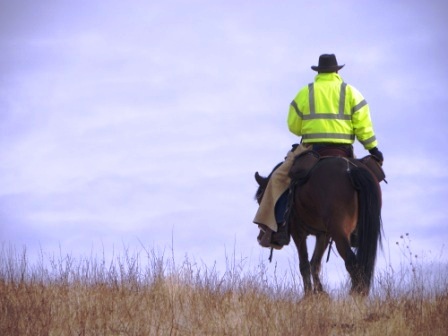 A day that started out rather benign and somewhat boring, quickly turned into something a bit more wild and western. Read on for an account from each rider, in their own perspective of the events to unfold. Many movies get the audience hooked by zooming in on the lead character in some dangerous situation and then flash back to a scene 24 hours earlier. Here is such a scene, starring Rob Adams. we are attacked by cougars or serial killers. 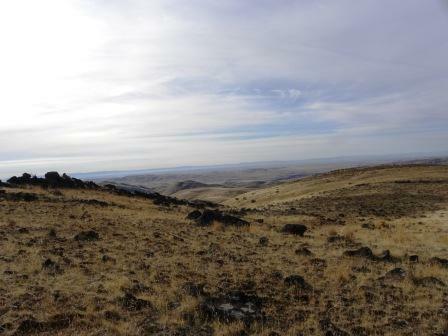 Rob chose the Wild Horse Management area, just north of Emmett on 4 mile road, hoping that we would get a glimpse of a band of mustangs that roam this part of the desert. Rob was familiar with the area; however, this was to be my first trip. I was excited to finally have the chance to see Mustangs in the wild. Rob rode his bay Mustang, Payette. The four year old was doing well for a green broke colt. He plodded along, picking his way through dense lava fields that covered 90% of the area, with familiarity born of a desert horse. Jack, on the other hand, was not born of the desert. I purchased Jack from a breeder as a young colt. Until I started him two years ago, he was pasture bred and born. Jack carefully picked his way through the rocky terrain with ease. His hard, black hooves held up as well as any horse of the high desert. Laurie! You and your Beanie Weenies! I’ll swear. lol….and well, I wouldn’t miss one of your blogs after our pack trip. Of course, I have to make sure you don’t stretch the truth in the process, especially if I’m in the story. Rob, I’m happy you and Payette made it out safely. I think I’d still be shaking after that one. OMG!!! Am I sorry I skipped that ride! I could have stood there and worried about it all while Laurie took pictures and documented it all! shoot! man am I glad everybody’s okay! It sounds funny now, to read it. I can picture Payette sliding down that slope then doing a twisty turny summersault. I don’t like the part about the hooves thrashing around your head, Rob. Whoa, Rob. That was a close call! Of course, I don’t have to tell you that. I am SO glad to hear that you and Laurie figured out a way to untangle you and Payette and unpin your leg. Scary! I am glad I wasn’t there to see it- I would have been so worried! Anyway, Glad you are alive, my friend! Those were both good renditions of what might have been a terrible wreck.